This was an afternoon and evening ruled by "the rules". More later. Present were Jonathan, Laurens with new games, Rich a bit and Bouko even later with his new prototype. Jonathan's latest purchase from the Asmodee world. Nice looks, more depth than expected. But the rules, oh the rules! We sort of ignored the irrigation of our gardens and that took roughly one third of the actions away and made gaining tile tiles way too easy. I think Torsten won this one, did he? Before splitting up in two groups, we gave this one a go. Again, rules took a while to sink in. In the end the unbelievable happened: We had 4 winners with 11 points each! So Jonathan with 9 must really be the first! Laurens had the big box, and we played sort of a mix with basic and expansion cards. Did not go well. The rules were clear this time, and the shipbuilding good fun, but we always got the wrong cards! Way too many planets and not enough fighting. Corinna won this game, to her own surprise, since she had always been way behind everyone else. 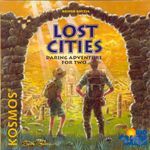 While the crew was gearing up for space travel, our two Indiana Jones's Torsten and Jonathan went in search for Lost Cities, with T. having been more successful, I hear. After some soup we tackled the latest version of Bouko's proto. Jonathan and Rich left after the explanation, with a promise to try another time. Chris joined us and we had much fun discussing various mechanisms and shattering meteorites. It is great to be able to help creating something new and fascinating. Can't wait to give it another go! Thanks for the ancient coin rewards, Bouko, lovely idea!